Google Drive can be utilized as a good method of backing up your files. In this article we will explore a couple of ways to use Google Drive for this purpose and explain some of the pros and cons. This method of using Google Drive as a backup is probably the most convenient as it syncs files as changes are made automatically. 3. In the list of folders, you should see one titled "Google Drive"
Note: Anything you place in this folder will sync with your Google Drive account. 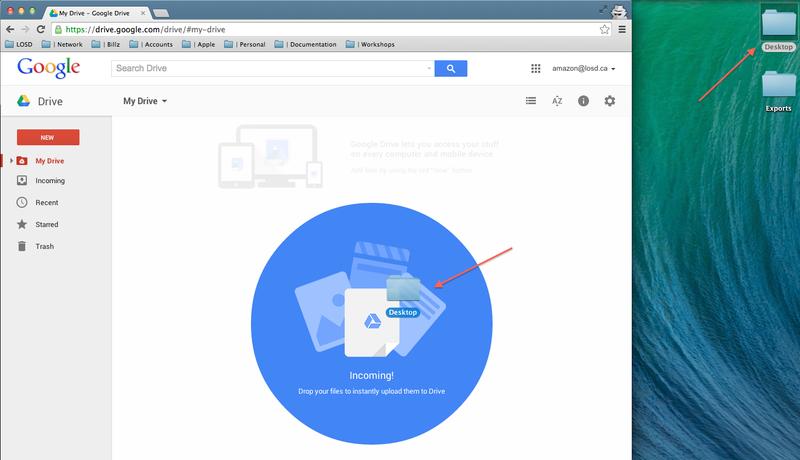 Meaning, if you placed a document or folder from your desktop into this folder, then went to drive.google.com and logged into your account, you would see that it is available there. Additionally, if you make any changes to the document, while it exists in your Google Drive folder, those changes will be synced and backed up to your account. 5. 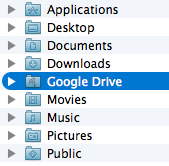 To place a shortcut on your desktop, right-click the Google Drive folder and select "Make Alias" from the menu. Or you may choose "Make Alias" from the "File" menu. 7. Now that you have the Google Drive folder on your desktop, it is time to start dragging and dropping files and folders into it. 8. 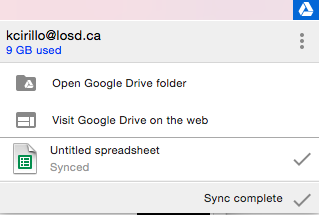 To check the status of your file sync, you can check the Google Drive icon at the top of your screen, it will either say "Sync complete" or tell you how many more files it has before it is completed. 9. After you have placed all of your important files in this folder, make sure to keep them there. Once they are removed from the folder, they are also removed from Google Drive and are no longer syncing. Note: Inside this folder, you can organize your files by creating other folders to place them in. These folders will be reflected in your Google Drive account. Additionally, if you were to create and or organize files and folders in the Google Drive interface, this will be reflected in the Google Drive folder on your desktop. Note: Only files and folders that are in the web based "My Drive" folder will be synced. Any files and folders that are shared with you by another user will only exist in the "Incoming" folder and therefore will not be synced. You may copy files and folders from the "Incoming" folder to your "My Drive" folder and then they will be synced. This must be done through the web based version via a web browser. This method of backing up is more of a manual way to upload files and folders to your web based version of Google Drive and does not automatically sync files on your computer or changes to them. 5. Once complete, you will see your files and folders now appear under "My Drive"
Note: Remember, this is a manual process and any changes you make to the original file on your computer will not be reflected in Google Drive until the updated version has been uploaded and vice versa.